Add blueberries to mixer bowl, chop for 3 sec/speed 6. Scrape bowl down. Add cream and blend for 3 sec/speed 8. Scrape bowl down and repeat. You can substitute blueberries with whatever frozen fruit you like, larger fruit may require more blending however, so adjust accordingly. You can add 2-3 drops of liquid stevia for sweetening if required. Here is a dairy free version. This recipe was inspired by ceduna.sa.gov.au "Instant Icecreams in the Thermomix"
At step 1 use speed 8 and process for longer if required. Hi there,I check your blog named “Pinterest” daily.Your story-telling style is witty, keep doing what you’re doing! And you can look our website about proxy list. ANOTHER amazing guilt free treat that is delish! Thank you Nik!!! I did half blueberries half raspberries- amazing! Quick, easy and hits the spot. Thanks Nik. So unbelievably good! I was craving something sweet for a late night treat without compromising my healthy eating. This hit the spot beautifully and was so simple to make, i think it will be my go-to dessert from now on! Wow!!! So simple and quick… Did I mention yum??? Made my first one with mango… Will be trying the cherry option next!! Loving your recipes for LCHF!!! Wow! 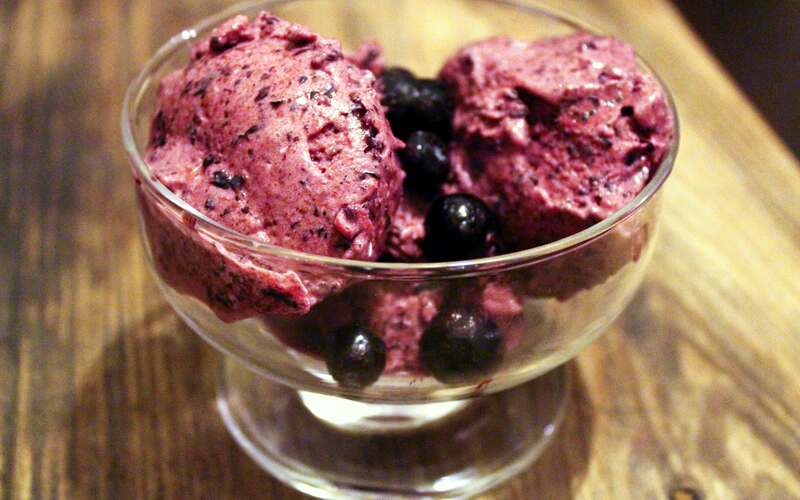 I’ve tried this with raspberries in the past but the blueberry is BY FAR the most delicious! Yum!!! Wow, so delicious and easy, so fresh. Definitely will be making again and again. So yummy, made it with frozen cherries and coconut cream for dessert but would also make a great addition to fruit, muesli or at room temperature with porridge. Made a cherry version as had frozen leftover cherries from Xmas. Kids love it too. Just made this for the kids with some whole strawberries i had in the freezer. The kids are loving it! I did add slightly extra time to blitz the berries as they were large. Will definitely be doing this again! I use pure double cream and frozen organic blueberries. Oh my goodness this is dangerous! I could eat it all day was way too amazing!! And way too quick!!! Only problem with it is i had a share! 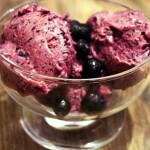 A delicious alternative to fruity dream for those who cant have raw egg or are after a more ‘creamier’ ice cream. I tried with strawberries so took a little longer to blitz but cant wait to try blueberries or mango! i made a strawberry version as that it what I had in the freezer. I used coconut cream so the dairy free toddler could have done too. I needed a bit higher speed and longer time with the whole frozen berries? I did speed 10, 10 sec. .scrapped down bowl and did 3 lots of speed 6, 10 sec with scrapping down each time. The result was beautiful and creamy. I as a sweet tooth would ad a bit sweetener next time. The kids ( 2 and 5) devoured it as it was. Thank you for a great quick treat recipe! Delicious at any time of the day, even breakfast!